Why does Patrick think Catacomb Sifter will be the sleeper card of Battle for Zendikar? Rate: Catacomb Sifter compares favorably to Hordeling Outburst (a Standard quality Staple) on multiple dimensions. It is three power and four toughness (an upgrade over three power and three toughness) for three mana, also over multiple bodies. Though two bodies are less abusable with pump effects than three bodies, Catacomb Sifter is at least closely in the conversation… Not to mention better whenever you don’t have buff cards. Synergies: Catacomb Sifter is a natural best friend to Liliana, Heretical Healer, and great to flip over alongside Liliana with Collected Company. It will both contribute to Ramp strategies and even compete with conventional three drops, like Anafenza, the Foremost! 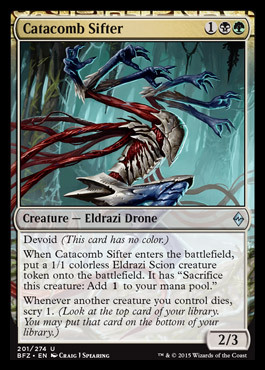 Scrying: Scrying is a heck on an ability to get “for free” … Especially when Catacomb Sifter comes ready with an Eldrazi body to get the Scrying engine going. It can combine with other Eldrazi Scions just as easily. And anyway, if there’s one thing you don’t want to do, it’s let your Eldrazi opponent scry to whatever cards he wants, for free. While Catacomb Sifter projects to be the set’s big sleeper, the discussion in this podcast touches on lots of different Eldrazi (and Eldrazi Scion) setups and strategies. How does From Beyond compare with Explosive Vegetation, Hedron Archive, or Frontier Siege at the four? Everyone knows that Ulamog, the Ceaseless Hunger is the Big! Bad! of Battle for Zendikar… But what other giant Eldrazi (or other big threats in general) might you want to ramp up to? What about going after little threats with tutor cards instead? Makindi Sliderunner! Snapping Gnarlid! Pilgrim’s Eye! Makindi Sliderunner is one of three exclusive preview cards Top Level Podcast got for Battle for Zendikar. Quick verdict on Makindi Sliderunner… We like it! Makindi Sliderunner will probably see play, and might be legitimately good. It is a probable inclusion not only for R/G Landfall beatdown decks, but just a pretty good card for a Mono-Red beatdown deck to play at the two. 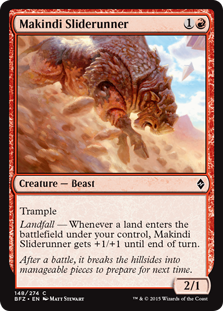 Makindi Sliderunner is usually going to hit for three or more damage per turn. It starts off as a 2/1 creature so “[i]t just can’t get that bad” (per Mike)… and will hit for three or four damage on many turns, depending on if you have a regular land or a fetchland to play pre-combat. 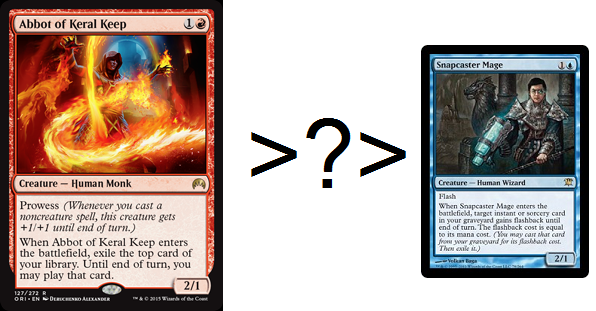 For one thing, Snapping Gnarlid is a great answer to Twin Bolt… Kinda? 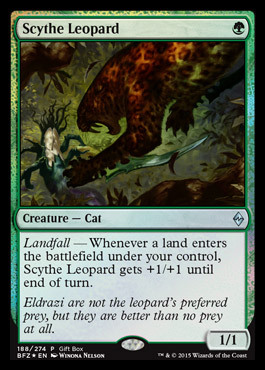 If you start on Scythe Leopard and follow up with Makindi Sliderunner, your R/G Landfall deck is going to be quite vulnerable to a Twin Bolt two-for-one on turn two. Playing Snapping Gnarlid on turn two instead is going to (at least) avoid the two-for-one right there. Our two-person consensus is that — at least based on what we’ve seen so far — R/G Landfall is going to be a real deck! Mike likes the second point of toughness, in general, more than trample. This is particularly relevant on turns where you don’t have and landfall trigger, and when the opponent is trying to defend himself with Goblin tokens or Eldrazi Scions. 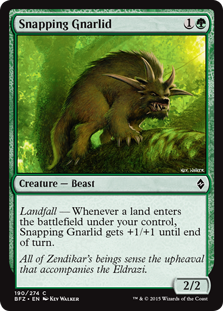 Mike recognizes that because red doesn’t generally have as strong of creatures (on the fundamentals) red might appreciate Makindi Sliderunner more than green does Snapping Gnarlid. For his part, Patrick gives the slight edge to the red version; among other things, it will probably be the more widely played of the two. Our final exclusive preview: Pilgrim’s Eye! Mike claims he doesn’t want to play Pilgrim’s Eye. Unsurprisingly, it takes Patrick about 15 seconds to pull Mike back to the Church of Pilgrim’s Eye. 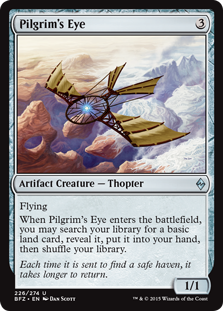 U/W Thopter Spy Network decks have a hard time finding playable artifacts to turn the Thopter Spy Network on to begin with; between Pilgrim’s Eye and Hangarback Walker, U/W has a great start in getting the [artifact] ball rolling. In addition to our three exclusive preview cards — Makindi Sliderunner, Snapping Gnarlid, and Pilgrim’s Eye — the Top Level Podcast duo discuss more Battle for Zendikar mana bases, the Retreat cycle, and how to procedurally play your Undergrowth Champion. Abbot of Keral Keep Better Than Snapcaster Mage? Patrick is tearing it up at Grand Prix Oklahoma City! At the time of this writing he’s 8-1… and with a brand new deck (that was hinted at in “Abbot of Keral Keep in Modern”). Rancor + Abbot of Keral Keep?!? Rancor seems like just one of many sweet cards the Abbot can flip over that not only gives it greater cachet than the admittedly deserving Snapcaster Mage (in this deck)… And one that not only triggers Prowess but, via trample, makes triggering Prowess better than ever. Follow Patrick’s exploits tomorrow at the mother ship. While Patrick and Michael originally intended to focus on Kiora, Master of Depths this week, a “mail bag”-style rundown uncovered some amazing synergies between fetch lands and battle lands. Matthew pointed out that Silkwrap, Suspension Field, etc. can help you set up your Eldrazi. These kinds of white exile cards can help you buy time to get to your expensive cards, plus any “exile” fuel for Blight Herder is potentially welcome. Now, if your Silkwrap is destroyed by Dromoka’s Command, the opponent won’t even get his creature back! While Scythe Leopard is less explosive than Steppe Lynx at its best, among other things, it can do damage on defense. On average, and over the course of many games, Scythe Leopard might outperform the white model on average. Do you know who Abzan Aggro’s new best fried will be? 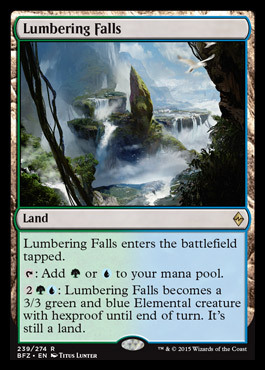 Flooded Strand can find both Sunken Hollow and Canopy Vista (along with basic Plains), allowing it to find all three colors in Abzan (if by way of blue for black); you never actually have to tap for blue to get the value. The alternative was you were going to gain 1 life from your Thornwood Falls? Chris asks about Nissa’s Renewal… Will this be a tool for Sultai Control to ramp into Ulamog or Ugin? Patrick speculates on a couple of different kinds of players who will want to cast a Nissa’s Renewal. MichaelJ points out that we have been doing this for “either forty-three or forty-four consecutive weeks” … and points out that Siege Rhino has pretty much been the best card in Standard the entire time. Shout out to the World Championships! Siege Rhino was facing off against Siege Rhino in the hands of World Champion Seth Manfield and former Player of the Year Owen Turtenwald. Well… Enough for Siege Rhino for now. How about some sick Battle for Zendikar previews? Gideon, Ally of Zendikar is not just a powerful four mana Planeswalker… It will be a likely four-of in Battle for Zendikar Standard. Gideon, Ally of Zendikar is a self-contained card advantage engine. Creating a 2/2 creature each turn being kinda, sorta, drawing a card each turn (and kinda, sorta, netting 1G while you’re at it). Besides which, the 2/2 in question is an Ally… Which can give you some untold number of free Ally triggers! 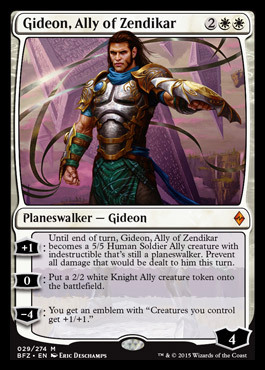 The flashy ability on Gideon, Ally of Zendikar is yet another look at his Planeswalker animation ability. This time Gideon is a 5/5 Human Soldier Ally (so might topdeck some of those Ally triggers himself) that both avoids taking damage and is actually indestructible. Who is going to stop Gideon? Now of course there is the [-4] emblem ability. This, we think, is the ability that can push Gideon from mere Staple to four-of. Why? You can always just sacrifice a Gideon, Ally of Zendikar (that starts with four loyalty) to cash in the emblem… There is much less down side to playing multiple copies here; especially given the long-term synergies with making 3/3, rather than 2/2 creatures. Mike also speculates on a Gideon, Ally of Zendikar-driven “sit there” strategy that makes 2/2 creature to block or chump while hitting land drops, milking the opponent into playing multiple creatures into an End Hostilities, and then wins quite a bit later with Secure the Wastes or an emblem activation. This strategy is made available largely due to Gideon’s built in card advantage abilities. Which Ulamog is better, the original Ulamog, the Infinite Gyre or Battle for Zendikar addition Ulamog, the Ceaseless Hunger? What are the key differences between the two takes on the 10/10?